Energy poverty is a widespread phenomenon. Close to 15% of the world’s population still has no access to electricity and when available, it is often either unreliable or too expensive. Access to clean energy, however, is crucial in the fight against poverty. When reliable and affordable sources of energy are missing, most economic activities become difficult to establish and run, homes are left without light for homework in the evenings and health can get compromised by the intensive use of kerosene, charcoal and so forth. Obstacles to energy access can be political (inequality, lack of investment in inclusive infrastructure, lack of political will, subsidies for fossil fuels, etc…), but they are also often financial. For households without access to electricity, upfront costs for installing solar panels for instance are often prohibitive. Finding innovative financing mechanisms can thus dramatically increase energy access. There are some great initiatives out there, have a look at some of them newly posted on our Connect4SD Solution Directory. Mobisol, winner of multiple awards, for instance works to facilitate access to low-cost solar home systems in rural Rwanda and Tanzania. 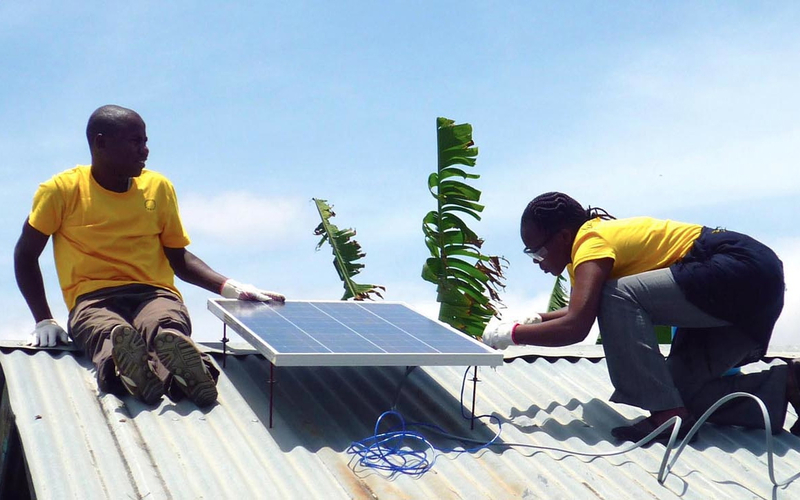 Combining ICTs, solar systems and microfinance, Mobisol has developed off-grid solar kits that users can finance with a 36 months installment plan using mobile banking services like M-Pesa. By breaking down the total cost of the kit into multiple installments, Mobisol helps low-income households access energy without investing in a costly installation upfront. Using mobile banking also eliminates the need to possess a bank account (which is often unavailable in rural areas) in order to be able to pay the installments. Similarly, Azuri has developed a pay-as-you-go service to facilitate access to climate-friendly energy. Users pay a small upfront installation fee for their solar panel and can then top-up their account and purchase electricity using a scratchcard or mobile money system. Through the purchase of top-ups, customers pay off and unlock their solar system for subsequent unlimited use. Do you know of other smart financial mechanisms, projects and initiatives to facilitate energy access? Contact us to add your own initiative on the Connect4SD Solution Directory!